Harbormaster Genoa - STØLÅS Watch Co.
Click the button below to add the Harbormaster Genoa to your wish list. Where design and function meet both luxury and ruggedness you get the Genoa. The STØLÅS Watch Co. was devoted to creating a time piece that could be worn and enjoyed as their only watch in his/her collection. The instrument would have to incorporate the everyday user’s needs as well as the fashion and appeal needed for luxury brands. In order to do so, we would have to create something unique with all new drawings and computer design work, use top shelf parts gathered from around the globe, and develop some new technology into the piece. After over a years worth of work the dream has become the Genoa. 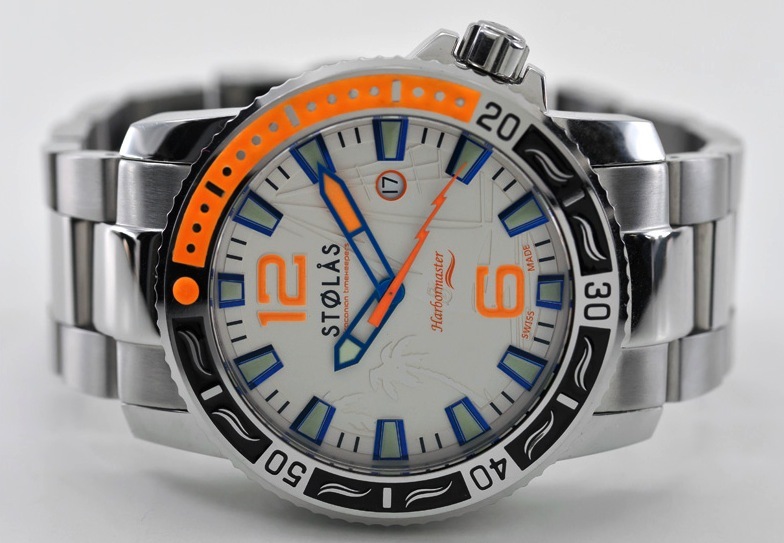 Sporting full stainless steel construction with a STØLÅS developed case mold and divers bezel featuring the Harbormaster wave logo. It showcases a full lumed bezel, a first in the industry, along with a yacht themed embossed dial with applied blued markers and hands. VERY LIMITED SUPPLY LEFT - ALL MADE TO ORDER - NO STAINLESS BRACELET BUT ADDED A DARK BLUE GENUINE CROCODILE STRAP WITH SIGNED BUCKLE. 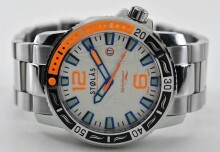 This Swiss Made instrument boasts an ETA movement visible through it’s sapphire exhibition case back and is packaged with a SS bracelet, Rubber strap with orange stitching, and custom colored NATO. The Genoa features two different luminescence paints that add contrast for easy day/night viewing. So, what ever your future brings, the Genoa is designed to be the watch worn for a lifetime of adventure. I am really excited that I got in on the Genoa when I had the chance. It is a gem in my collection. Even though it didn't cost as much as some of the others, I know it will gain in value and become a true collectors piece. I love this watch. It really craves attention with its big size and exotically patterned face. The orange parts contrasts nicely with the stainless steel. It is also surprizingly accurate - less than 3 minutes slow each month. The only reason I do not give this a full 5 stars is the stainless steel bracelet which has a lot poorer standard than the rest of the watch. The removable links are held together with thin metal bars with a thickness similar to a small paperclip. The stamped metal clasp looks out of place on such a nice watch. Lastly, after removing an appropriate number of links, there are only 2 adjustable settings, leaving the bracelet either too loose or too tight. I have purchased all three watches in this series and love them all. I have owned a number of high end watches costing thousands more and I can honestly say that these watches equal them in most every way. While each model appears similar, they have very different personalities when you have them in front of you. The Spinnaker is sporty, the Harbormaster has a formal sense about it, and the Genoa is at home on the beach and in the office. The dials appear almost three dimensional, especially the carbon fiber ones. As mentioned in another review, the dial and indices on the genoa truly pop out. These are a very nice addition to the watch world. I look forward to Curtis' next models. I first purchased the Spinnaker, and liked it so much I got the Genoa. Both are fantastic watches. The Lum is amazing on each. The time keeping is great on each. The rubber straps are the best looking/comfortable of any i have every seen/owned. The blued markers on the Genoa are fantastically cool (in sunlight they POP!). Really, overall I am extremely pleased with these. Also, you should know, the very personal customer service from Curtis Stolaas is UNMATCHED by any other company I've ever dealt with!